I finally got hold of the Coastal Scents 88 palette. I got mine in the Original that comes in mixture of matte and shimmer eye shadows. Ever since I started YouTube and Blog, I have been hearing beauty gurus rave about this palette. So now that I finally have it, I want to do a quick review and some swatches as well. You will be charged a couple of more bucks for tax and delivery. I'm not really sure how much the total amount was because my cousin from CA was the one who got it for me. They gave me a small kabuki brush and an eyeshadow sampler. It also comes with a built-in mirror and two double-sided sponge applicators. From the palette, you will see how lovely the colors are. 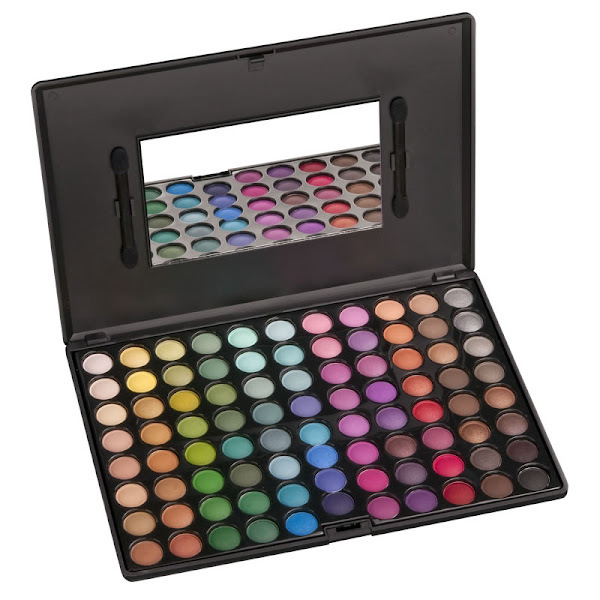 The colors range from off-white, some neutral tones, pigmented shadows to the darkest black. Here are the swatches of the eye shadows. I swatched the shadows per column going from the lightest to the darkest. I tried, but the first 8 colors were too pale and seemed to only take the color white so I didn't include a photo of them. I really like this product. You'll get 88 eye shadows for a really affordable price. However, I noticed that some colors are chalky and fall off when applied on skin. You can fix it though, by using a really good eye primer prior to application. I had fun doing this review. I felt like a painter swatching all the colors on the paper. Here's a final look for the 80 colors.